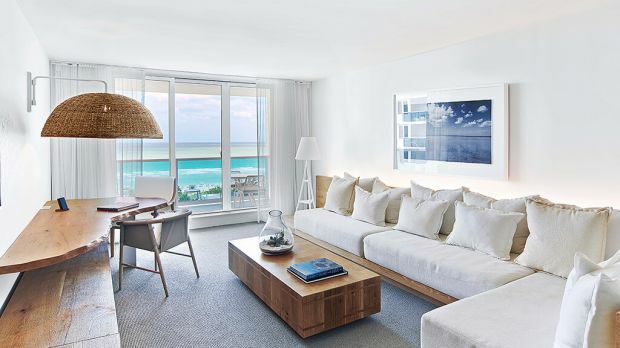 Enviar una solicitud de disponibilidad con las fechas que desee a 1 Hotel South Beach. Features 1 King bed, complimentary Wi-Fi Internet and Nespresso coffee machine. Features ocean views, 1 King bed, kitchen, washer, dryer, sofa bed and Wi-Fi Internet. Features 1 King bed, balcony, Wi-Fi Internet and Nespresso coffee machine. Features 2 Queen beds, Wi-Fi Internet and Nespresso coffee machine. Features 1 King bed, kitchen, washer, dryer, sofa bed and Wi-Fi Internet. Features 1 King bed, balcony, kitchen, washer, dryer, sofa bed and Wi-Fi Internet. Features 2 King beds, Wi-Fi Internet and Nespresso coffee machine. Features 1 King bed, living room, private bedroom and Wi-Fi Internet. Features 2 King beds, balcony, Wi-Fi Internet and Nespresso coffee machine. Features 1 King bed, Wi-Fi Internet and Nespresso coffee machine. Features 1 King bed, balcony, private bedroom, living room and Wi-Fi Internet. Features skyline views, balcony, kitchen, washer, dryer, private bedroom, living room and Wi-Fi Internet. Features 1 King bed, balcony, ocean views, private bedroom, living room and Wi-Fi Internet. Features ocean views, balcony, private bedroom, kitchen, washer, dryer, living room and Wi-Fi Internet. Features a baloney, kitchen, washer, dryer, living room and private bedrooms. Features a balcony, kitchen, washer, dryer, living room and private bedrooms. Features 2 King beds, 2 private bedrooms, balcony, living room and Wi-Fi Internet. Two bedroom penthouse features a kitchen, washer, dryer and private bedrooms. Two bedroom penthouse features a balcony, kitchen, washer, dryer, living room and private bedrooms. Features three private bedrooms, ocean views, balcony, kitchen, washer, dryer, living room and Wi-Fi Internet. Features a king bed, balcony, kitchenette and spacious living room. Features five private bedrooms, ocean front views, balcony, kitchen, washer, dryer and Wi-Fi Internet.